WAFFLES: Hey Boss? Did you hear? Glogirly found paw prints on the kitchen counter! KATIE: Well they're not mine. What did you do, Waffles? WAFFLES: Nothing, Boss. I swear it. KATIE: Seriously? I'm supposed to believe someone who gets caught in the kitchen cupboards everyday? WAFFLES: Yeah, but there's food and stuff in here. And I never go in when anyone's looking. WAFFLES: I KNOW! Especially in the middle of the night. KATIE: And no one saw you TP the Townhouse the other day either. So that roll of toilet paper just flung itself down two flights of steps? WAFFLES: Maybe it was running out! KATIE: Waffles, I think this latest one has your name on it. And your paw prints. Dear friends... we need YOUR help in solving this heinous crime. Every morning Glogirly dusts for prints when she spritzes the foamy spray-cleaner on the kitchen counter. Foamy spray-cleaner doesn't lie. Two cats of interest have been identified in connection to the countertop crime. Though both have alibis, investigators have not been able to substantiate either cat's story. 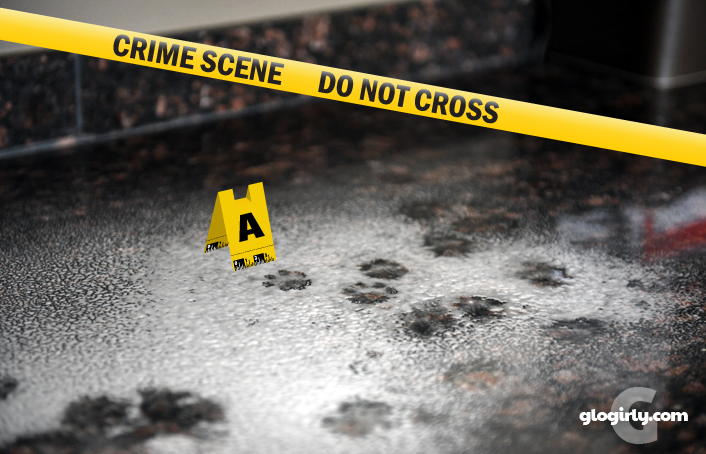 Due to Glogirly's obsessive-compulsive countertop cleaning, crime scene investigators have ruled the paw print evidence inconclusive and are seeking help from the general public in hopes that someone may be able to make a positive match on the prints and paws. Or, how about let's just take a vote? Katie is light on her feet so it must be Waffles. "....maybe it was running out." Waffles, you better come up with a better story! Waffles, I bet it wuz you only cuz us orangies are always gettin into trouble! Got to be Waffles Katie is too smart to get caught! It was that scoundrel, Some Cat! He slung litter all over my floor again too! With all the townhouse crimes lately, we say it's Waffles. Glogirly needs to do a DNA test. 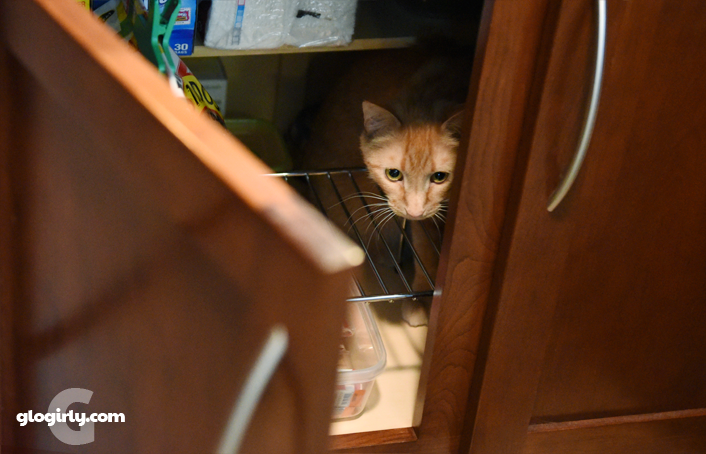 Waffles, were you looking for chicken again? How do we know it wasn't both of you?? That's what we think! 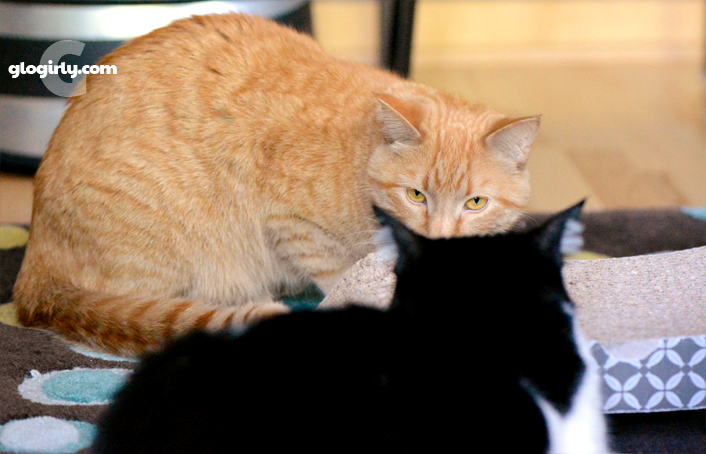 The evidence does not look to be in your favor, Waffles, MOL. those look too small to be Waffle paws and we KNOW Katie would never be bad....GASP - someone broke into the townhouse and walked on the counters!!! Hmmmm interesting case. The obvious choice would be Waffles, however, wouldn't it be the paw-fect crime if it WAS Katie? Because of course she realizes that the first kitty people will blame is Waffles....so in the end, she gets away with it! Hmmmm! Agreeing that "it's totally fine to commit a crime just as long as no one sees you"...Waffles, you should be in politics!!! Waff... it doesn't look good for you, dude. Those look like Katie prints to me. The problem is..even though no one sees you during the night..Glogirly knows how to find out in the morning..your gonna have to hide that spray can Waff..
Those paw prints are awful dainty, so it must be Miss Katie. Waffles has mancat sized paws. Sorry Katie, but I got to go with the evidence. Waffles looks like you might be on the safe side of this, but not everyone agrees. What Glogirly needs to do is somehow put a dust on the counter that you can't lick off and won't stain the carpet and floor, but will stain your paws and see who has the dyed paws in the morning and then she'll know who the bad kitty is. My human is disappointed because there wasn't a write in vote - she wanted to say ME?!??! I NEVER do that, honest. Especially when no one is looking. Katie, are you trying to frame Waffles? I think you have been set up Waffles. Those paw prints look quite dainty. Uh oh! We think it was Waffles! What you needs to prove this is nose prints. They are unique to each cat. Paw prints, won't prove anything. Did Glogirly CSI check for fibers? I mean, furs? That's a hard but; those almost look like smaller paw prints to me. Sorry sweet Katie.